Hummus. Need I say more? This tasty, creamy, and protein packed snack doesn’t need too much of an introduction. The go-to snack and salad/sandwich topper transforms anything it touches into a meal that is hard pressed to beat! It takes the typical quick snack or meal and turns it into something that will fill and satisfy all your needs and nutritional wants. Hummus does pose the problem of controlling yourself to only eating the recommended serving of 2 TBSPS. 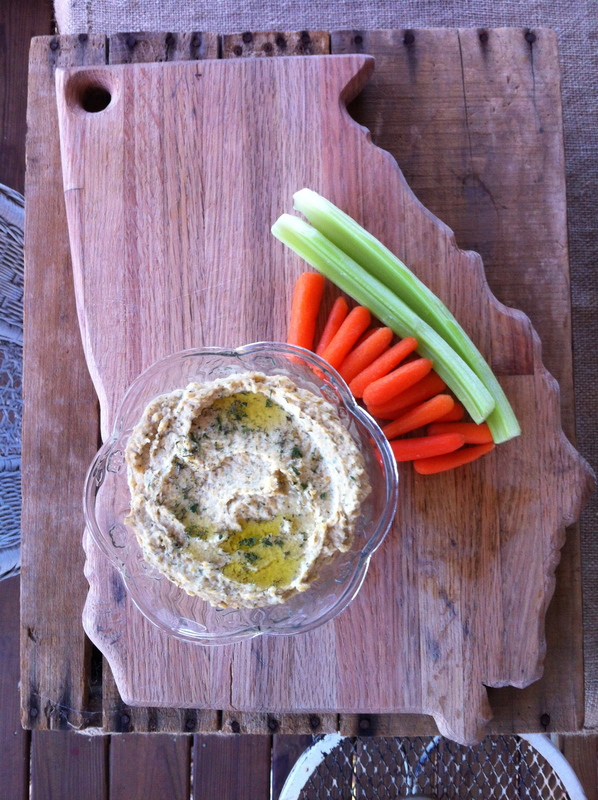 To be honest, once you dip those crunchy carrots or sweet bell pepper strips into this dip you don’t want to stop! Or least that’s the case for me! I use to hunt the isles of Whole Foods and Fresh Market to try and find that perfect flavor to satisfy my hummus craving, but most of the time I would just settle for what ever they had in stock. Finally, after many disappointing trips to the market, I decided to learn just exactly how to make my very own hummus. Since then my world has been changed, and only for the better! Once you learn the basic components of hummus your possibilities are ENDLESS! Mixing and mashing flavors to test those not so typically, and sometimes a little odd, flavor cravings, will become addicting and something that if don’t done then your day is just really not complete! Trust me, this has happened to me on more than one occasion! This instant burst of inspiration could appear at any moment, such as during your morning routine of drinking your coffee or tea and watching Kelly and Michael. A combination of peanut butter, maple syrup, and cinnamon could pop into your head, forcing the immediate reaction to run into the kitchen, grab your food processor and chickpeas, and start testing those ingredients. Did I mention this has happened to me? When I say it has happened to me I mean while I was writing this the other morning drinking my green tea and watching Kelly and Michael, I jumped up in a fit ran to the kitchen and made some hummus! Now don’t worry I am not giving you the recipe for my sweet and salty hummus (which by the way was an amazing topper to my “fried” un-fried cinnamon sugar pita bread. It’s sweet and salty and had protein so I could feel a little better about the amount of sugar I consumed in one sitting! 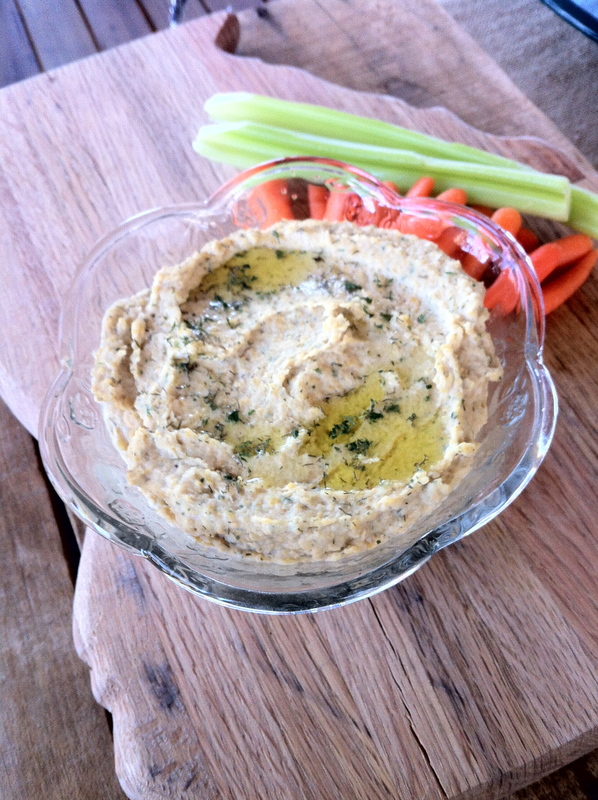 ), but instead an amazing roasted garlic and dill hummus! Now let me give you a little warning: if you are making this to impress a crush on your first date keep some gum or breath mints on hand because again…THIS IS A GARLIC DELICIOUSNESS based hummus. Cut the top third of the garlic head off and drizzle with olive oil and season with salt and pepper. Return the top third to the base and wrap in an aluminum foil bundle. Place in your preheated oven and roast for 30 mins. Once 30 mins has passed remove the foil bundle and set aside. In the base of a food processor (or mixer if you have a high powered mixer) add your drained and rinsed beans, tahini, olive oil, lemon juice, water, 1 ½ – 2 TBSP dill, 1 TBSP parsley, and 2/3 of your roasted garlic head (all you have to do is squeeze the base of the garlic and it pops right out! No mess or fuss!). Once starts to combine and gains a smooth consistence add your water 1 TBSP at a time to get the consistency you desire. 6. Taste the hummus at this point to decide if more seasoning is needed. Here is also where you can add the remaining roasted garlic if you wish for a stronger garlic taste. Once the hummus is smooth but still thick, remove from food processor and transfer to a dish. Cover and refrigerate for 30 mins before serving. Trust me chilled hummus is much better than warm hummus! Before serving, drizzle the top with olive oil and sprinkle with more dill and parsley. Now that you know the basic components of hummus, chickpeas, tahini, a liquid, spices, and a vegetable, you can really let those creative juices flow and become one of the few and self acclaimed hummus masters!